March is Arts in Education month, a time to recognize the outstanding music, theater and art programs within our schools. Many schools will be participating in district and state visual and performing arts activities, so be sure to check with your school regarding upcoming arts celebrations and events. The St. Augustine Art Association is presenting the 12th annual All-County High School Art Show March 3-April 2. A community outreach partnership with St. Johns County Schools, this juried exhibition features selected art by students in grades nine through 12 and is sponsored by Carr, Riggs, Ingram. The materials range from experimental digital media and graphite studies to abstract pottery and sculptural assemblages. The student winners will be recognized at the April 11 School Board meeting. Our thanks to the St. Augustine Art Association, who is the partner and co-sponsor of this event as well as for the upcoming All-County Middle School Art show in April. Congratulations to all the dedicated teachers and students who participate in these incredible displays showcasing the many talents of our students. March is also Music in Our Schools Month the purpose of which is to raise awareness of the importance of music education for all children and to remind citizens that schools are where all children should have access to music. The study of music is basic to the complete education, engages students in individual and group activity, develops creativity and problem-solving, as well as critical and evaluative skills. The Transportation Department will be receiving 21 new school buses from Integrated Coach (IC) over the next 30 days. After completing a thorough technical inspection of each bus, they will go into immediate service transporting over 21,000 district students. These new buses are part of the annual capital budgeting plan to replace/retire older buses and expand the fleet to support continued growth. The Transportation Department, continuing its focus on student safety, will expand and enhance training capabilities and opportunities to all its personnel. These include achieving eight state-certified operator trainers and three state-certified operator testers; recurring inspection certifications for school bus mechanics; specialized engine training with Cummings; expanded behind-the-wheel training for all operators, specialized scenario-based training for ESE transportation personnel as well as an intensive training week for all department staff. Parents and guardians should expect to see district school bus training countywide the first week of August in preparation for a successful start to the school year. The transportation department is preparing to implement a new bus transportation routing system known as Bus Planner. Bus Planner has inherent safety capabilities which will assist operators and routing personnel in establishing and sustaining the safest and most efficient bus routes and stops for student riders. School bus route information for the 2017/2018 school year will be provided via SchoolMessenger to all parents and guardians in July. Routing information may also be found in the transportation section of the district website as well as in the eSchoolPlus Home Access Center (HAC). Annually the district’s Building Code Administration staff, in conjunction with all school site managers, performs annual inspections as required by the State Requirements for Educational Facilities (SREF). These inspections focus on code compliance for fire safety, casualty safety and sanitation. All required inspections are complete, and school personnel along with maintenance department staff are addressing any remaining deficiencies in advance of the submission deadline to DOE. Since instituting the District’s Energy Management Program in 2008, the district has surpassed the $40 million mark in energy cost avoidance. Each year the Environmental Protection Agency (EPA) and the Department of Energy (DOE) recognize organizations that have made outstanding contributions to protecting the environment through energy efficiency with an Energy Star Award. During 2016, 95 percent of all St. Johns County School District facilities received the Energy Star Award for outstanding energy conservation efforts. This year’s winter break shutdown was one of the most successful to date for the district. Spring Break is quickly approaching, and the district team is looking forward to a successful spring break period with nine days of energy savings. Construction is underway for K-8 School “KK” in the Nocatee community and “LL” in the Aberdeen community. Building foundations are complete at both sites and work is progressing on the slab-on-grade as well as the forming and pouring for the concrete tilt-wall panels. The schools are scheduled to open for the 2018-2019 school year. The construction of Elementary School “M” in the World Golf Village area is currently underway and on schedule for completion in early summer 2017. This 110,000 square foot facility is being constructed to Green Building Standards and will open for the 2017-2018 school year. Allen D. Nease High School’s major expansion project is ongoing, with the 600 student station, two-story building addition on schedule for completion this summer. The kitchen renovation, dining room expansion and new bus loop were completed and have been in use since August. Additional site improvements and existing facility pod renovations are scheduled to start summer of 2017. Dining room expansions are nearing completion at both Pacetti Bay Middle School and Valley Ridge Academy. These dining room expansions are being constructed to alleviate overcrowding in these existing facilities and are expected to be in use by the end of March. The facilities and maintenance department leadership teams are currently conducting annual life cycle meetings at all district schools for capital maintenance and operating needs. Reports generated from these meetings assist in determining the specific needs of schools, scheduling of capital maintenance projects, and establishing a budget for the upcoming fiscal year. Installation of 34 relocatable classrooms at 10 separate school sites is underway to address district growth. Relocatable classrooms include the full complement of permanent classroom facilities including integrated building management systems and controls, audio enhancement, wireless accessibility and smartboard technology. All classrooms will be ready for the 2017-2018 school year. The payroll department issued 5,900 Form W-2, wage and tax statements to current and former district employees. Of these, 2,501 were processed electronically to employees on January 15, with the remaining 3,399 hard copies sent on January 30. Also, the accounts payable department processed and issued 624 IRS 1099 Tax forms to district vendors. Beginning each February, the budget department turns its attention to the next school year. Preparations are being made to build school operating budgets including FCTC. District department budgets are formulating now as well. Food and Nutrition Services is preparing for the USDA Administrative Review scheduled in April. This is a comprehensive review of the National School Lunch Program, School Breakfast Program and After School Snack Program. The department is also planning for summer food service which serves breakfast and lunch to children 18 years of age or younger. There are two types of feeding sites, closed and open. Closed sites serve children enrolled in a sponsor’s program, and open sites serve anyone 18 years of age or younger as walk-ins. Sites are determined by geographical need and will be determined closer to the end of the school year. Site information is available on the Summer BreakSpot website at www.summerfoodflorida.org. The purchasing department, in partnership with the principals for Elementary School “M” and Allen D. Nease High School, is working with multiple vendors to meet the furniture needs of the new elementary school and the high school expansion. Delivery and installation will be early summer. Since January 1, 2017, over 15 competitive solicitations have been released by the district, and interested parties are encouraged to participate. For more information on how to do business with the district, please visit www.stjohns.k12.fl.us/purchasing/. On January 20, the St. Johns County School District held its second annual “Love to the Rescue” jeans day. 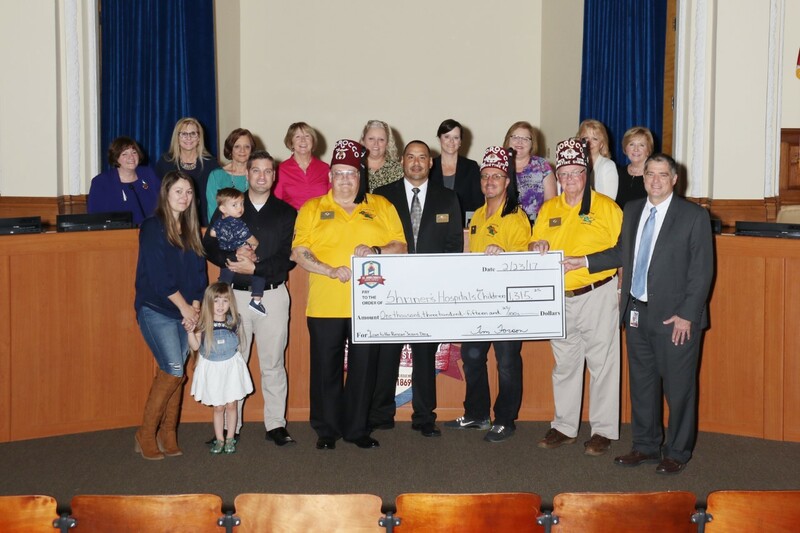 The day’s efforts raised $1,305.25 donated to the Shriners Hospital for Children in Tampa. Shriners Hospitals for Children provides specialized care to children with orthopedic conditions, burns, spinal cord injuries, and cleft lip and palate, regardless of their financial situation. More information can be found on their website at www.shrinershospitalsforchildren.org. Congratulations to Sreeniketh Vogoti, an eighth-grade student at Fruit Cove Middle School, who gets a second chance at the Scripps National Spelling Bee. He won the 73rd annual Florida Times-Union Regional Spelling Bee for the second year in a row Saturday in a record 51 rounds. His final correctly spelled word was “facade.” Sreeniketh represented North Florida in 2016 and was one of the final 10 spellers in the Scripps championship round.